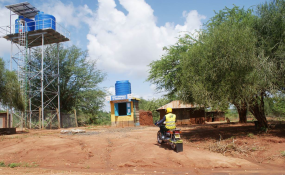 A view of a solar-driven water collection point in Marimanti, a village in eastern Kenya, December 14, 2018. Barcelona — African countries must tackle climate change with a new economic model rooted in clean energy, forest protection and technology to support farmers - but they will need more investment and research to make that happen, leaders said on Thursday. French President Emmanuel Macron, who hosted the "One Planet" climate summit in Nairobi, highlighted the example of West Africa's Solar Mamas, a group of female engineers who install solar systems in their villages. Their work both improves their social position and brings renewable energy to local people, he said. Africa cannot repeat the mistakes of the past made by industrialised nations that grew rich using power produced by burning dirty fossil fuels, such as oil and coal, he added. "For me, the key to African emancipation is how we construct a new model" that aims to build a sustainable future for all, Macron told heads of governments, corporations, development banks and others gathered in the Kenyan capital. Kenya, for example, already gets three-quarters of its power from renewable sources, including solar, geothermal and wind, he said. At the summit, the third of its kind aimed at mobilising finance and other resources for global climate action, Kenya's president pledged his country would ensure forests covered at least 10 percent of its land by 2022. Madagascar's President, Andry Rajoelina, said his government planned to grow trees in local nurseries so every inhabitant could plant at least five per year to recoup forest losses, and also would provide new cooking stoves that use less wood. The World Bank Group's interim president, Kristalina Georgieva, said Africa had "the most incredible opportunity" to move onto a path of low-carbon economic growth. It still produces only 1.5 percent of its electricity from solar power, compared with 7 percent in Germany, which has much less sun, for example. Africa, while responsible for just 4 percent of global greenhouse gas emissions, is struggling with the impacts of climate change - from drought to floods - with 65 percent of its people directly affected, she noted. In response, the World Bank Group plans to spend at least $12 billion in Africa from 2021-2025 to support adaptation and resilience projects, its officials said. Those efforts would include helping get weather forecasts and insurance to poor farmers, as well as restoring degraded land and coastal mangroves, Georgieva said. "I have faith that the men - and especially the women - of Africa will be the custodians of our beautiful planet," she told the summit. Wanjiru Kamau-Rutenberg, director of African Women in Agricultural Research and Development, said there was a need to put women farmers, in particular, at the centre of research on how to adapt to a warming world, and Africa should develop its own scientific capacity to do that. Those aims were being supported by a $15-million partnership between her network, the Bill & Melinda Gates Foundation, the BNP Paribas Foundation and France to provide fellowships for 600 young scientists in Africa and Europe to work on climate change, she said. "It is absolutely critical to increase the numbers of women - especially African women - who are leading research," she added. United Nations Deputy Secretary-General Amina J. Mohammed said far more money - including private cash - was required to ensure Africa could "grow green" and not "grow brown". "We are telling the world we need trillions (of dollars), but the investment flows are not travelling at the speed they need to, at the scale they need to, and we need to do something about unlocking it," she added. Many African and other developing countries had prepared climate change action plans and strengthened their governance to be able to attract more finance, she noted. To coincide with the summit, the London-based International Institute for Environment and Development (IIED) issued a report showing how billions of dollars in climate finance could be used more effectively to help people pursue green development, whether they live in urban slums or rural forests. Not enough climate finance - less than 10 percent - was reaching local communities in poor, vulnerable nations, it said. The paper explored how three locally developed funds had set up their own mechanisms to distribute small amounts of cash to groups - from slum-dwelling families in Zimbabwean cities to women palm-nut collectors in Brazil - to help resolve the diverse problems holding them back. Most climate projects funded by international donors are designed by distant experts, often miss local priorities and struggle to respond to new opportunities, IIED said. A significant share of money also goes on administration costs, diverting it from helping communities adapt to climate change and develop low-carbon economies, IIED said. Clare Shakya, IIED's director of climate change, told the Thomson Reuters Foundation international donors should set a target of getting about 60 to 70 percent of the money down to the local level. Climate summits, like that in Nairobi and another planned in September, organised by the U.N. chief, offered an opportunity to bring about a shift in how the system works, she said. "We are really hoping that there will be a clear commitment to local finance ... and (to) understand the reforms in the system that are needed to enable that," she said. Read the original article on Thomson Reuters Foundation. Copyright © 2019 Thomson Reuters Foundation. All rights reserved. Distributed by AllAfrica Global Media (allAfrica.com). To contact the copyright holder directly for corrections — or for permission to republish or make other authorized use of this material, click here. East Africa: Can Disruptive Technologies End Perennial Famine in East Africa? Africa: NGOs Are Shaking Up Climate Services in Africa. Should We Be Worried?